To my dad’s dismay, one of my favorite genres of books is self-help. I find it oddly inspiring to read these books as a way to try to make myself better. My best friend consistently jokes when I reach a roadblock in my life, “Well I am sure you will find a way to fit it into one of your challenges.” This referencing my incessant 30 or 40 day plans: vegetarian, vegan, more organized, the list goes on and on. While my dad may not always appreciate my book selections, he is part of the reason why I am so quick to take up these types of tasks. My parents, when talking to me about my school performance, would say, “We don’t care about the grades you get as long as you try your hardest and work smart.” This was inevitably met with a sigh on my part because I realized quickly, you can always improve and it’s this idea of doing more which reminds me of my Kinaaldá. A main focus of the ceremony is the physical act of running. The girl is responsible for running early in the darkness of dawn and at noon. Running to the east, she runs farther than the previous run. The run is symbolic of the importance to push yourself to be stronger. This month I celebrate my 30th birthday. August is a special time as it reminds me to do very critical things – to give thanks and love more. My late Nalís, among so many things, taught me the importance of gratitude and love. They did so by showing me what it was to be generously thankful and love fully. 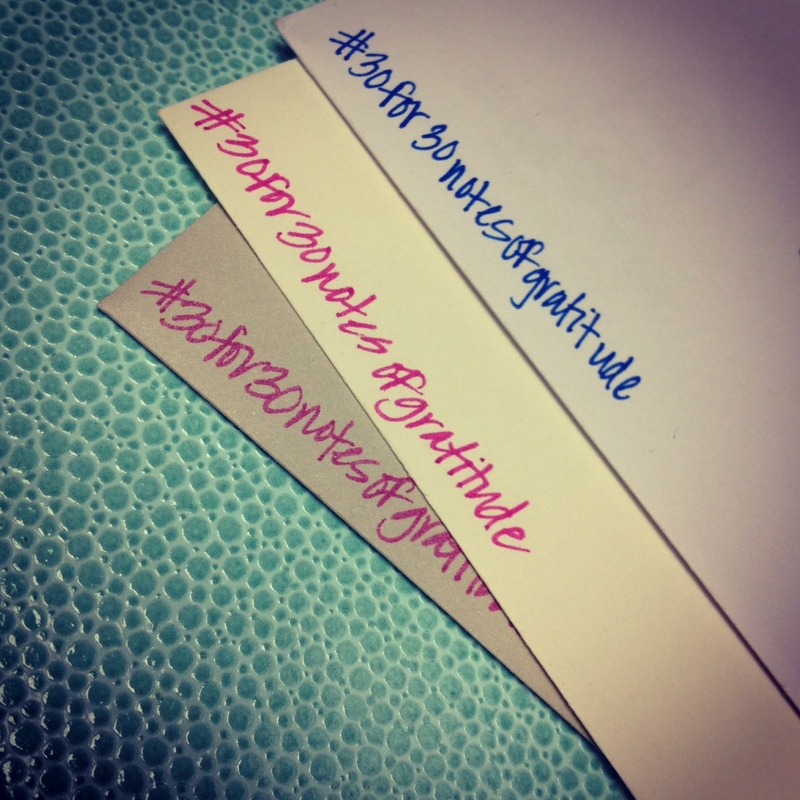 For this reason my birthday month challenge is #30for30notesofgratitude, meaning every day this month I am sending or hand-delivering a note of gratitude to someone who made an impact on my day. I firmly believe it is through the practice of gratitude and loving one another abundantly we can change the world. What can be more profound or have greater impact than the giving of ourselves selflessly. My first few letters were to my grandparents thanking them for the lessons they instilled in my but most importantly, I thanked them for showing me the power of love through their love for one another. What a wonderful idea! Kindness can certainly go a long way, and your writing gave me that reminder, thank you. What an inspiration!!! Lovely…. I am inspired to pay if forward and do this on my birthday as well. Happy 30th birthday this month! You are wise beyond your years because of the traditions and ceremonies in your life, and because you were loved and taught well. All that positive energy flows through you back into the world. Thank you! Experience is personal. How we think and feel about our situation is intrinsic, but that is where the individual ends. Everything beyond our own minds and body is social. We live in the company of others, and rarely exist without them. Yet others are also the cause of many irritable common occurrences. Today, more than ever, we experience ambiguous circumstances regarding the motivation, attitudes, and beliefs of others. Their impact on our private being cannot be escaped. Social is our situation, and important civic developments are required if our intent is to excel in the arts of associated living. The circumstances of uncertainty are familiar but clearly a new model is needed if we desire a citizenry capable of overcoming the challenges of our current era. Why is perhaps the most difficult question to tackle in our current period of hyper-individualism. Understanding why any other person needs help, and why they should receive it is crucial in solving our social ailments. Why, has its impetus in our choice of government. The fact that we have chosen to rule ourselves under the auspices of Democracy requires as many people as possible participate in a fully informed manner. It necessitates they make smart decisions pertaining to the choices laid out by the elected officials. To use a worn cliché, a mode of government dependent on the intellect of the people is only as strong as its weakest link. In our society the least likely people to participate are the non- or under educated. Non-conversant populations are the who in a theory of change. Usually a person with a low education does not feel connected enough to participate. They recognize little title to their surroundings, and consequently lack the feeling of responsibility to come forward with an alternative proactive voice. Undereducated people also do not have the attention to give to the issues in their society. They are caught in the vicious cycle of survival, and devote much of their energy maintaining a steady situation of food, clothing and shelter. In our society, American Indian people are the ethnic group with the highest education hurdles. Indian children score lower in both math and reading versus the national average, and have a nearly 50% dropout rate in high school. It was mentioned “why” is the most difficult step in a theory of change. The reality is all steps pursuing collective transformation are difficult. Despite the flash of genius myths, hard work and persistence is a requirement for innovation, and the how has become increasingly difficult in our contemporary current of apathy, stereotypes and lassitude. Taking note of our social incongruities and their origins is important, but to advance our public’s position it is mandatory to be connected. The key is communication. It has been posited by some of the greatest minds that not only do we need to speak, we need a new language. Art is the new idiom. Through expressive experiences we are able to present information to people in ways they have not previously received it. When we promote Art, we promote authentic, creative, diverse conversations, and a society interested in a progressive meaningful style of communication has the best chance of constructing the natural pillars of Democracy: interaction, pluralism, community and growth.